Does anybody besides me remember watching a birding show on PBS? It was a series, about 10 years ago, hosted by Don and Lillian Stokes. I loved that show. But since it aired around five in the morning I always taped it and watched it later. Yes, taped it, with a cool device called a VCR! The Stokes series ended but the plucky husband and wife team are still very active in the birding community. 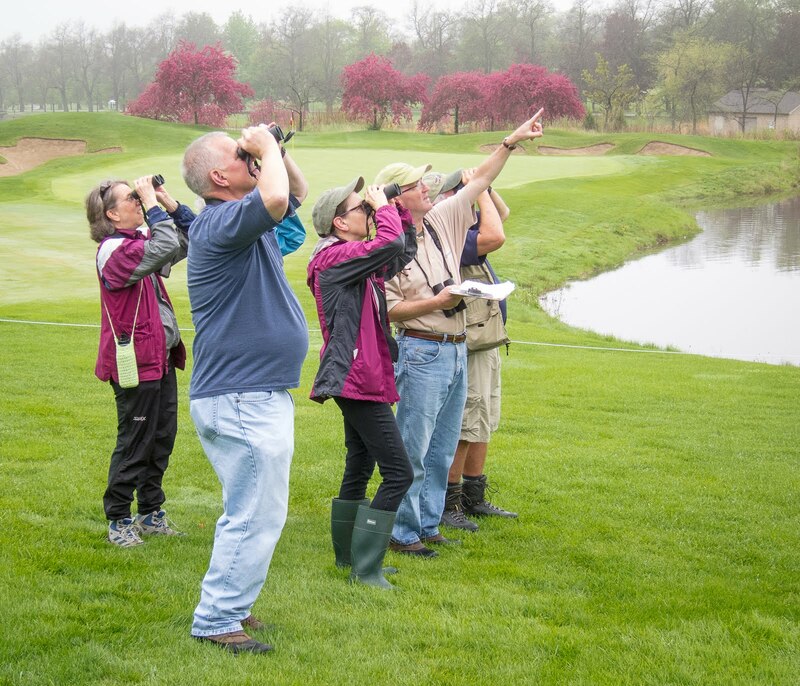 Some of us had the thrill of meeting them last month at a DuPage Birding Club meeting held at Cantigny Park. It was a fun night, and the audience of 200 treated Don and Lillian like rock stars. At the very least they are birding celebrities, well known not only for the TV show but for numerous books and bird song CDs over the years and even Stokes-brand binoculars. The Wheaton appearance was all about an extraordinary new book: “The Stokes Field Guide to the Birds of North America.” In tag-team fashion, Don and Lillian talked about its creation, a six-year project, and showed how and why the guide is different than others on the market. The bright orange 792-page brick with a painted bunting on the cover (Lillian’s favorite bird) was impossible to resist—for me and for 94 other birders who lined up to buy a copy and have it signed by America’s best known birding couple. Others brought along copies they’d purchased when the book first appeared last fall. Some birders collect field guides, old and new. Others, like me, accumulate them. I own the Sibley, Peterson, National Geographic, Golden, Smithsonian and Audubon guides. And now the Stokes. My library includes several classic guides picked up at used book sales, and a reprint of Roger Tory Peterson’s original “Field Guide to the Birds,” published in 1934. I may have more books than I really need, but I do use them all—sometimes in the field but mostly at home. They are amazing resources for learning about birds, including the common ones. At least one guide is usually parked on my nightstand. No two field guides are alike. If you are looking to buy one, by all means go to a bookstore and see all the choices. The two basic formats are illustrated and photographic. Like many birders I generally prefer the illustrated books, like the Sibley or Peterson. They show you how “typical” members of a species should look because the pictures are drawn or painted, and key field marks are emphasized. The new Stokes book is photographic. There are 3,400 images in all, about 500 of them taken by Lillian herself. This is far more than any previous national field guide. A top priority was to show more flight photos and sure enough 800 shots are of birds on the wing. Some will take your breath away, including Lillian’s pileated woodpecker image on the back cover. The Stokes guide is notable for more than just its outstanding pictures. One of my favorite features is the rarity code given for each species. The 1 to 6 scale, established by the American Birding Association, indicates the ease of finding a bird in its normal range. This information is especially handy when birding in new places. I also like that each photo is labeled with the month and state in which it was taken, in the lower right corner. For me, the Stokes book will be a stay-at-home reference. It’s simply too thick and heavy to carry in the field. At the Cantigny presentation, Don and Lillian showed a picture of the guide on the front seat of a car, with a seat belt around it. Keeping your copy safe is an excellent idea—it’s that good. Another new field guide that I’m eager to investigate further is “The Crossley ID Guide,” by Richard Crossley. This book, for Eastern U.S. birds only, is being heavily marketed as “revolutionary” in design. It features large, lifelike scenes for each species, digitally composed from the author’s photographs. There are 640 scenes, created from more than 10,000 photos. The birds are shown in their usual habitats at different distances, stationary and in flight, giving the reader a good sense of size, shape and behavior. It’s an appealing format with minimal text. When David Sibley’s book appeared in 2000, it seemed like no other field guide would ever be necessary. It was and still is a masterful work. I see the Eastern birds version on the trails more than any other resource, and the original full-size version, national in scope, is a permanent resident of many back seats and trunks. But here we are in 2011 and new guides with true innovations are still being printed. As birders, are we lucky or what? And of course many birders now prefer to carry an electronic guide, loaded on a mobile device. In addition to pictures, range maps and everything else a traditional field guide provides, they have the songs and call notes of the birds at their fingertips. That’s nice but so far I’m still a “birding without batteries” advocate. At home I’m all about technology, like that VCR I mentioned before. It still works! Fortunately we have a DVD player too because Lillian and Don Stokes said they plan to release all 26 episodes of the “Stokes Birds at Home” series this fall. Like another new field guide, the boxed set will be hard for me to pass up. Copyright 2011 by Jeff Reiter. All rights reserved.